In all of our special education classrooms we have some students that greatly struggle with exhibiting challenging behaviors. Over the years I realized that one of the symptoms, and sometimes even the cause of, challenging behavior can be low self-esteem. Always getting consequences for exhibiting behaviors they have a hard time controlling definitely takes its toll on a kiddo! Self-esteem building can come in many forms, and I have found 3 easy to implement ways to help boost your kiddos self-esteem every day. Every morning, I invited my students to use our affirmation cards to find one that they needed for the day as a healthy reminder. At first, they needed a lot of prompting to find one that they really needed. Between our morning check-ins and reflecting back on yesterday’s challenging moments, a paraprofessional or I were usually able to problem solve with the student to find an affirmation that fit, and eventually the students can choose one independently. We color a picture of our affirmations for a 5 minutes, and then during our morning meeting, we announce our daily affirmation during check-in. When students have exhibited a challenging behavior or are having a difficult moment, I ensure that after every restorative/debrief conversation, I infuse some elements of positive self talk. I always ask students what emotion they’re feeling, and how they feel about themselves. We find a positive affirmation that can help them feel a little better about themselves, and if they aren’t willing to say the affirmation in that moment, I say it to them. I also remind them of their morning affirmation and how they is still true about them, no matter the situation. 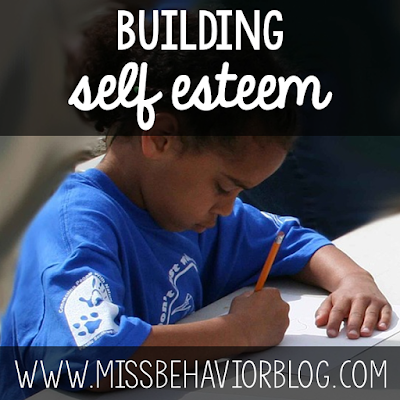 Self-esteem building is not an easy task with students, as we all know the adolescent years are impossibly hard even without the layers of having learning and emotional challenges. Intentionally adding self-esteem activities into daily routines really helped my students internalize these mantras. How do you help your students build confidence and self-love?